Erykah Badu Joins Forces with GoodWoodNYC for Limited Edition Jewelry! Universal Motown, GoodWoodNYC and ThinkTank Marketing have joined forces for a special venture to commemorate the release of Erykah Badu's new album New Amerykah Part 2: Return of the Ankh. Fans will have the opportunity to win a custom “Erykah Badu Ankh” jewelry piece (as seen in above image) designed exclusively by the masterminds of GoodWoodNYC. The light wood custom Ankh measures slightly over 2 inches with a 30 inch long dark wood beaded chain. 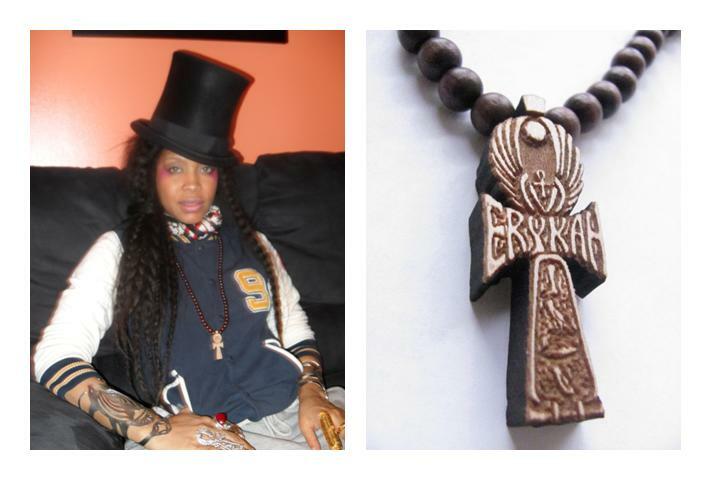 Only 50 custom Erykah Badu Ankhs were created for special online giveaways and will not be available for retail sale. More details to come! Remember Badu's new album, New Amerykah Part Two: Return of the Ankh, is in stores now! Hopefully, everything will work out this time.